This mixed media exhibition will highlight the symbiotic relationship between humans, plants and nature. Botanicals have been symbols and archetypes in the human imagination, throughout history and across cultures. My artwork is about these deeply rooted connections. Today many plants are threatened because of climate change and human-caused degradation. The human psyche also is under threat because of a disconnection from the natural world. American biologist Edward Wilson described Biophilia as the innate human love of nature in all its forms. My interests in depth psychology and conservation, my lifelong passion for the outdoors and wilderness, and my experience as an art teacher and outdoor educator, all inform my work in important ways. I create encaustic and mixed media paintings that engage symbolism and metaphor. My botanical abstractions are layered and suggestive. This exhibit will include encaustic paintings, mixed media works on paper, and a sculptural installation. Alison grew up exploring the Rocky Mountains in Canada. Her father taught her about geology and evolution, and her mother taught her about the beauty of the natural world. At seventeen, Alison began traveling around the world on two yearlong extended trips through Asia, and South America. She currently lives in Albuquerque, and maintains a studio at the Harwood Art Center. For the past sixteen years she has taught drawing and painting to high school students at Albuquerque Academy. Alison has a BFA in painting from the University of Calgary, in Canada, and a MA in Art Therapy from UNM. Her background in outdoor education and art therapy have given her a deep appreciation for the transformative and healing power of both nature and art. Her work has been in juried shows at the Albuquerque Museum of Art and History, 516 Arts, and the Encaustic Museum in Santa Fe. “Botanicals have long been essential symbols and archetypes in the human imagination. 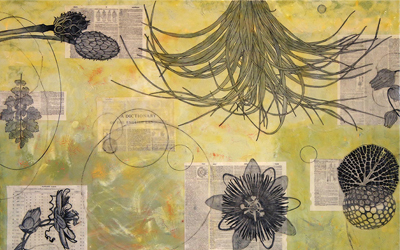 Using encaustic, oil paint, collage and drawing, I merge representation with metaphor to create botanical abstractions. Worldwide, many plants are threatened by human-caused climate change and degradation; the human psyche is also threatened when it’s disconnected from the natural world. Plants as essential to the human soul and imagination, as well as being essential to the health of our planet. In my compositions, I use color interpretively, combining the endlessly complex and varied forms of seeds, flowers, pods, and pollen with abstract elements. I include a variety of mixed media under and over the encaustic wax layers, to create visual depth.